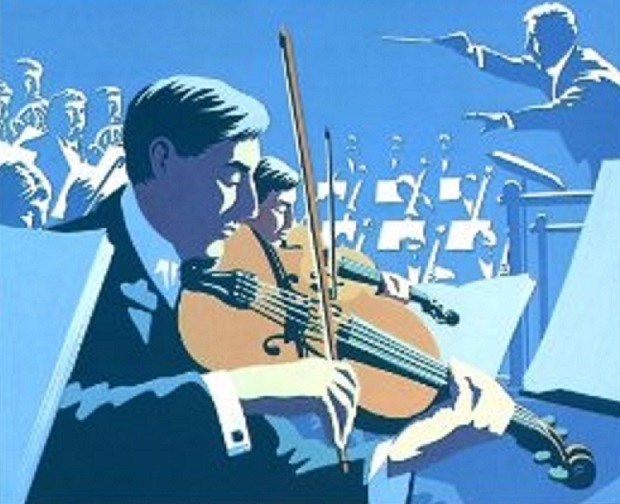 Front cover of The Young Person’s Guide to the Orchestra, as released on Decca London’s British Collection. Drawn by and (c) Andrew Davidson. Clips from the composer’s own recording with the London Symphony Orchestra. With thanks to Decca. The notes accompanying The Young Person’s Guide on the Britten Thematic Catalogue are worth reprinting as an accurate history of the piece. ‘The music was originally composed for a film, Instruments of the Orchestra, made by the Crown Film Unit for the Ministry of Education, produced by Alexander Shaw (b. 1910), directed by Muir Mathieson (1911-1975), with a script by Montagu Slater (1902-1956). The film featured the London Symphony Orchestra conducted by Malcolm Sargent and was first screened on 29 November 1946 at the Empire Theatre, Leicester Square. As a concert work, the piece may be performed with or without the commentary. The theme is the Rondeau from Purcell’s Abdelazer, or The Moor’s revenge, Z 570/2′. Britten was not a fan of Sargent – to put it mildly – and struggled with his apparent willingness to take the credit for the film and its contents. But he thoroughly enjoyed writing the piece, dividing the orchestra into sections, then the instruments within those units. He finished it on New Year’s Eve, 1945 – rather appropriate for a year in which his devotion to Purcell had been unstinting. It is worth running through the instruments Britten chooses to show off in the Young Person’s Guide. The woodwind section comprises piccolo and two each of flutes, oboes, clarinets, and bassoons, while for the brass he chooses four horns, two trumpets, three trombones and a tuba. The percussion section is especially imaginative, Britten opting for timpani, bass drum, cymbal, tambourine, triangle, side drum, Chinese block, xylophone, castanets, gong and whip. These are complemented by harp and a full string section, which for the sake of completeness are first and second violins, violas, cellos and double basses. Eric Roseberry, writing in The Cambridge Companion to Benjamin Britten, sums up the composer’s achievement. ‘In a sense, this happy work brings to an end an important phase in Britten’s career. From now on, the orchestra (in particular the chamber orchestra), with no less brilliance and subtlety, was to join forces with the vocal Britten, the Britten of opera and song-cycle, the Britten of Saint Nicolas, the Spring Symphony and the later choral cantatas. Yet the early orchestral repertoire holds its place and is gaining increasing recognition. Far from being a youthful corpus that was overtaken by the ‘mature’ opera composer, it survives as a brilliant achievement in itself, fully consistent with Britten’s devotion to music as a language of human feeling’. What a thrill to listen once again to The Young Person’s Guide To The Orchestra, my own personal introduction to Britten, and I’m sure that of many others. It has the power either to regain a person’s childhood in the space of a few seconds, or to do exactly what Britten set out to do, educating young people on the instruments of the orchestra and their capabilities. One of the great things about this piece is that it needs very little analysis. There are no hidden meanings or references. It is just as it says – a guide to the orchestra. Within that there is ample chance to marvel at Britten’s resource in the way he groups the instrumental families, but also in the way he brings out their character. You can witness the military-style trumpets and snare drums, suggesting a marching band, or the expansive harp, whose swirling arpeggios form a rich slow passage in the centre of the piece, or the perky and mischievous bassoons. The final fugue is a triumph, expertly worked out but also managing a transition from the minor key to the major, its parts moving at different speeds as we triumphantly reach the close. There is a suddenly vivid parallel to Prokofiev’s Classical Symphony as the fugue establishes itself, brilliantly energetic, and the triumphant horn theme that brings back Purcell’s original carries all before it, a celebration of music itself to cap Britten’s ‘Purcell year’. The Young Person’s Guide is a reminder of how much fun music can be, and shows off the orchestra as one of its best resources. In writing this piece Britten was quite literally a kid in a toy shop – and it shows! Perhaps surprisingly the discography for this piece is relatively limited, but that is because there are several dearly loved versions. Eric Crozier’s text is also a rarity these days. For those preferring to do without the narration we have Britten’s own version with the London Symphony Orchestra, starting the Purcell theme with a hefty kick. The vividly coloured score is hugely entertaining here, and the fugue a real thrill. Digital sound aids our exploration of the orchestra in the hands of Richard Hickox and Sir Simon Rattle, who both offer excellent versions with their ensembles on top form. The idea of narrating a piece of classical music does bring Hollywood stars out of the woodwork. Few pairings in music are less likely than Crocodile Dundee star Paul Hogan and conductor Igor Markevitch, but they are surprisingly good on EMI. Hogan opts to use his own text, which is dry and pretty entertaining. “Keep together you lot!”, he exhorts on occasion, while also declaring the percussion section are the ‘full backs’ of the orchestra. It is that sort of flexibility that has made this piece such a success and made it available to such a wide audience. Clicking on this playlist link will give you access to versions by Britten himself, Hickox, Rattle, Steuart Bedford, Eduard van Beinum and the Concertgebouw Orchestra and the Boston Pops Orchestra, conducted by Arthur Fiedler. This entry was posted in Film Score, Listening to Britten, Orchestral, Uncategorized and tagged Benjamin Britten, Eric Crozier, Henry Purcell, Humphrey Maud, Malcolm Sargent. Bookmark the permalink.